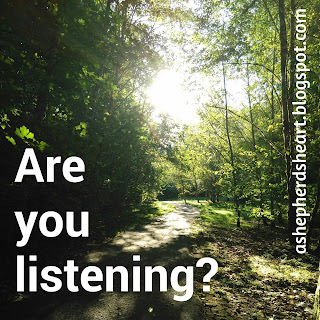 A Shepherd's Heart: Are You Listening? A Father's Voice has Power and the voice of your Heavenly Father has ultimate Power in your life if you're willing to listen! Just open your eyes and ears to see and hear Him! Check out this brief video. Watch until the end! It's worth it! I remember going there and spending lots of time of course there. He's heart would be racing and sometimes would be upset but once we sat next to him and talked to you...his heart beat calmed down to normal and he was at peace and he recognized my voice! He'd turn his head my direction and the the staff noticed too. So, I can relate to Michael Jr's sharing very much. Amazing! I guess it's because we talked to him before he was born and he also heard us talk before he was born in general. Wow! I pray that we'll learning daily to listen to the Father's Voice and open our eyes to see where He's leading! Audio / Video Venture...following God's calling!